1.) To expand my horizons and try things I hadn't either eaten or cooked with much. 2.) To really focus on eating primarily seasonal produce. Thus far, everything has been wonderful and tasty. So my expectations were high when this weekend I ventured to new territory with turnips. I went into dinner with a ton of enthusiasm and excitement to try something new. The rule in our house is we have to try something once before declaring we don't like it. So with that in mind, I found a recipe that sounded fail-proof. Sadly, fail-proof it was not, but I now know I DO NOT like turnips. In fact, for a moment I felt like a kid again, sitting at the dinner table being forced to eat something that smelled horrid. My husband quickly reminded me this was not the case and nobody was forcing me to finish the side dish (thank heavens!). But not all hope is lost as I've been told that parsnips don't quite have the bitterness turnips do. I might give those a try. If however, you are a fan of the root vegetable, you may want to give this recipe a try. After all, it did get an outstanding rating by other users. Roasted turnips, Sweet potatoes, Apples and Dried cranberries. You're so cute, Katie. 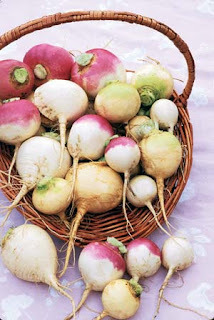 I actually love turnips raw, but cooked they are terrible. I like to put them on a veggie tray. lol oh no!!! i've never tried them but now i want to see what they are like!! !